June 8, 2018 /3BL Media/ - Eastman Foundation, in conjunction with the 2018 G7 Summit, is advocating for action in addressing challenges and identifying innovative solutions to better understand our oceans. 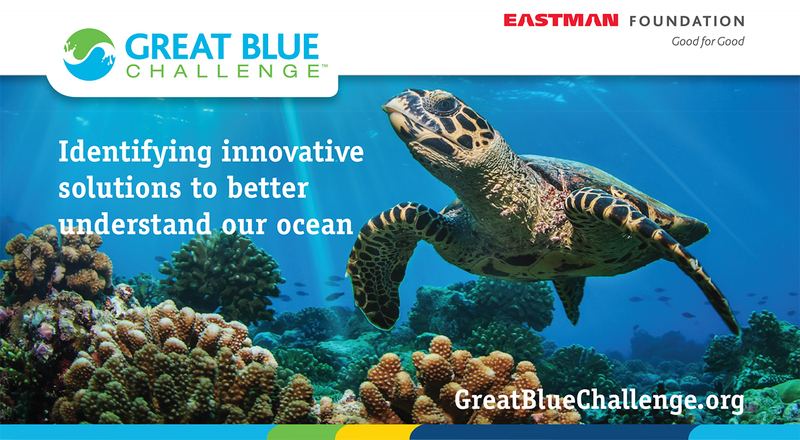 In celebration of World Oceans Day, Eastman Foundation is pleased to introduce The Great Blue Challenge. The Challenge is designed to spark innovation - and to find unique, creative and potentially transformative projects that will expedite ocean research. The ocean contains 97% of the Earth’s known water supply and is fundamental to our climate, atmospheric, weather, food, energy and water systems. There is no place on the globe where the ocean doesn’t matter. And yet, the message is simple – we need more data to better understand the complexities of the world’s most important waters. In short, we can’t manage what we can’t measure. With a prominent theme of "working together on climate change, oceans and clean energy", the G7 Summit is ideal for launching the Challenge and recognizing the opportunity to focus on solutions through education and innovation. In the supporting publication for the Summit by Climate Change – The New Economy (CCTNE), Eastman Advocates for Action and invites individuals associated with an internationally recognized university, research center, or philanthropic scientific initiative to take part in The Great Blue Challenge. All eligible submissions will be reviewed based on multiple criteria and finalists will have the opportunity to present their proposal in person or by videoconference to a panel of ocean science experts and business leaders. Eastman Foundation will provide up to $25,000 in grant funding through the non-profit, higher education, or charitable organization affiliated with the successful entry. To learn more about how the Eastman Foundation is encouraging innovation in ocean research and education, visit eastmanfoundation.com. The Foundation invests in initiatives that serve and strengthen communities around the world and improve the quality of life. The Foundation focuses its resources on organizations and projects in the areas of education, environment, empowerment and economic development. Learn more about the Eastman Foundation at eastmanfoundation.com and the company’s Corporate Responsibility initiatives at responsibility.eastman.com.